It is imperative that every business addresses its disaster recovery plan. Whether you have 2 users or 2000 users there must be a business continuity plan in the event that theft, fire or flood manifest themselves. Failure to have a suitable back-up and contingency plan will lead to a crucial loss of data, time, morale, clients, and may even threaten the existence of your company. 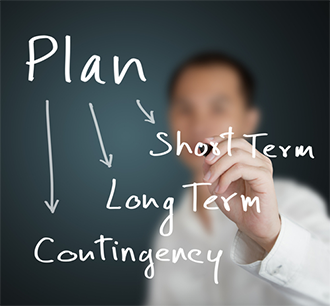 TSS provide a range of solutions in this field which are all based around your individual business continuity needs. On a strategic front we analyse your core activities and applications and design a plan which fulfils your disaster recovery requirements. We manage and implement the plan which will integrate with your existing infrastructure. Disaster recovery plans certainly don’t have to be expensive. The fundamental objective to a disaster recovery plan is to have your data held off-site. This is achieved easily through tape or disk back-up transported off-site or via a cloud back-up. The real challenge is in how quickly your data can be restored into an accessible format. Tape and disk restores may take days to realise a full working server system which for some organisations may be fine. However, most businesses want their data much quicker. Virtualisation technology provides the ability to access entire servers and applications within minutes and this is an inexpensive solution. If minutes is too long then TSS has the ability to design and implement a completely seamless network infrastructure ensuring systems are unaffected in any eventuality.